SPLASH AND BUBBLES is designed to encourage kids ages 4-7 to explore the natural undersea world. Developed with an advisory panel of top marine biologists, digital innovators and educators, SPLASH AND BUBBLES is grounded in a marine biology curriculum that focuses on themes of diversity, individuality, interconnectedness and the celebration of learning and discovery. The series also introduces the concepts of ecological balance and the importance of taking care of the ocean. 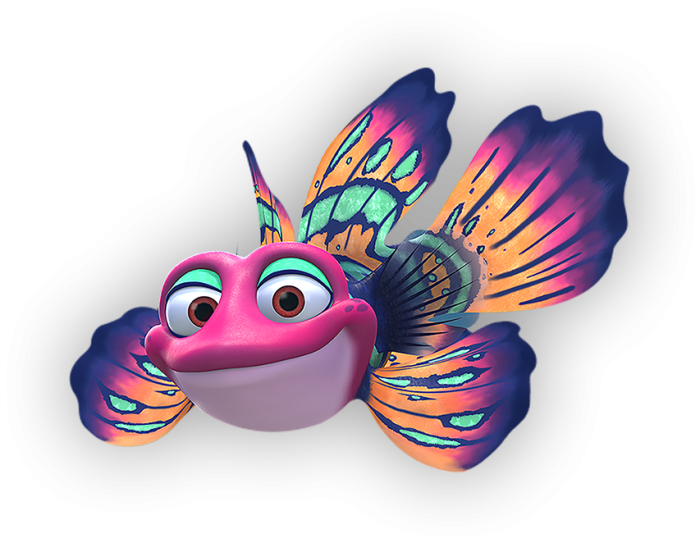 SPLASH AND BUBBLES follows the adventures of Splash, a yellow fusilier fish who has migrated all over the ocean before settling down in Reeftown, where he befriends Bubbles, a Mandarin dragonet whose vivid orange and electric blue coloring matches her colorful personality. Until Splash came along, Bubbles and most of the other Reeftown residents had no idea what lived beyond the cozy confines of their coral walls. Together, Splash, Bubbles and their friends explore the world’s undersea habitats, make new friends and learn about the many different ways life looks and lives in the ocean, celebrating the importance of diversity along the way. SPLASH AND BUBBLES premieres Wednesday, November 23, 2016 on WSKG TV at 10:00am! Catch the series Monday-Friday on WSKG TV at 10:00am and 2:00pm, Saturdays on WSKG Create at 8:00am, and Sundays on WSKG TV at 8:00am.